On October 28, 2010 Chanpa Rani Bhawmik was killed by a biker who ran his vehicle over her. 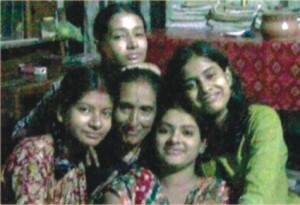 Her crime was that she protested the stalking of her two daughters by the murderer Rony Saha. Following the murder, workers and employees of Faridpur Sugar Mill where Chanpa worked and students of Faridpur Sugar Mill High School where the two daughters studied blocked the Dhaka-Khulna highway demanding exemplary punishment of the killers. Human chains were formed in support of the deceased woman who had to pay the ultimate price for trying to play the role of an ideal mother. But rarely five months have passed, and the tables have turned. Instead of the perpetrators of the crime, it is the family of the victims and the witnesses who are now on the run after friends and family members of the killer threatened the deceased's family with dire consequences if they sought justice. “Lack of social security and poverty acts as a deterrent for the victim's family to seek justice,” says Advocate Rehana. She says that the victims are mostly from the marginalised sections of society. In foreign countries, the witnesses are given protection by the state but in underdeveloped countries like Bangladesh, it is the victims and those that seek justice who find themselves in danger as there is no such witness programme here. “Often it happens that when a girl is stalked, or even raped, the victim's family instead of seeking justice marries their daughter to the offender,” says Rehana. She says that though these heinous offenders are worse than professional criminals, the victim's family feels that they have no other option but to give their daughter's hand in marriage to them. “Often it is said the victim's family is compensated by monetary means. But mostly, the victim's family does not even get the money, but the threats that ultimately influence their decision.” The sad reality is in spite of the stringent laws against stalking, the ground realities of Bangladesh is that when a stalker is determined, he is more likely to get the girl by pursuing his criminal activities. On February 21, 2011 Serafina Mardi died from burn injuries, after she had set herself ablaze four days earlier in protest of the arbitration. As it happens in Bangladesh, it was only after she committed suicide that the case received the attention of the establishment, the media and civil society. Lack of social security often deters the victim's family from seeking justice, but that does not automatically ensure security. On February 16, 2011, the corpse of 15 year old Tumpa was found floating on the canal at Dhaka-Narayanganj-Demra (DND) dam. She had been missing since February 14, after she was kidnapped by a gang who had been stalking her for three years. Post mortem on her corpse confirmed that she was raped and tortured. On the night of Tumpa's abduction, she told her mother Khairunnahar Shikha over the phone that she was going to die, and right after that the connection was cut-off. This was eerily similar to what her brother Babla had said to his mother, over the phone, eight months ago before his body was discovered five days later in Kakon River of Narsinghdi. Later, investigation revealed that Tumpa's brother Babla had been killed by the same gang that stalked her for three years and ultimately murdered her. Babla was brave enough to protest the stalking of his sister and he paid dearly with his life. His parents did not file any accusations against the gang because they feared for Tumpa's safety. Sadly they lost both their children to the same gang. Stalking had been a problem for women in this country for a long time. In recent times, following the suicide of many young girls who felt helpless in the face of the humiliation and murders related to stalking, the phenomenon has received increased coverage and society as a whole seems much more aware of its dangers. In spite of that, stalking has not stopped and every few days, we hear about new incidents where stalkers have murdered someone, or a young girl has committed suicide after failing to bear the mental trauma. “I personally feel that ours is a repressed society, there is sexual repression and this outburst is supposed to happen.” He says that Bangladesh is a transitional society going nowhere, neither towards the West, nor is it embracing traditional values. “In these transitional societies, moral and social values are vague,” he says. “Social values are very important,” he says. “Stringent laws against stalking may lead to its decline, but not elimination. Law enforcement agencies are also under resourced. A long term plan is required to eradicate stalking from the society,” he says. Professor Aminul also says that the police needs more sensitisation. “At the officer level, there should be training so that they are more aware of the problems,” he says. In the police stations it can be observed that when parents come to file a complaint about stalking, the police behave rudely and often make lewd comments. 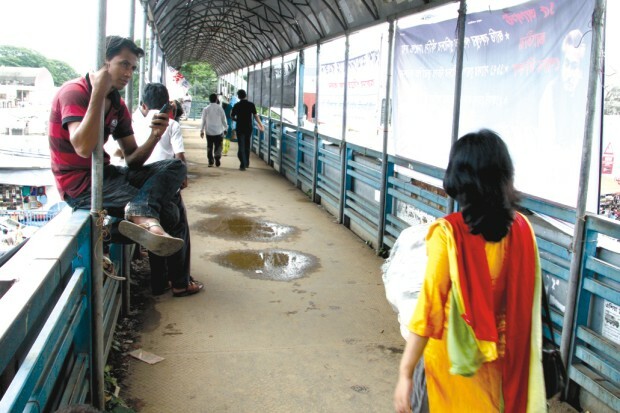 The Officer-in-charge of a police station in Dhaka said within earshot of a father who had come to file a complaint against his daughter's stalking – “what do you expect from these girls, they do not go to classes but loiter along with their friends. Of course, they are going to be teased.” Such attitudes discourage people from asking the police for help. The continuing trend of stalking has encouraged more radical thoughts even among many noteworthy individuals. Columnist Syed Abul Maksud voiced his own view at a conference on women's rights – “Bangladesh should follow the footsteps of Malaysia. In Malaysia, the authorities whip perpetuators of gender violence. Our legal system should accommodate such strict punishments that shall deter criminals from committing these activities.” If the trend continues, authorities might well take heed of such opinions and impose more drastic measures, as the so called stringent laws that have been formulated so far have had very negligible effect.